The new Fiat 500L Wagon Estate is a family friendly five-seater that comes with the option of two extra seats. It looks a bit unusual, thanks to the fact that it’s essentially a stretched version of the standard 500L model, but it’s hard to argue with the value that’s on offer. For one thing, it’s got lots of room inside, it’s practical and it’s easy to live with on a daily basis. Read more about Fiat, from 1899 when the company was founded, up to today in our informative article about the history of this Italian car manufacturer. 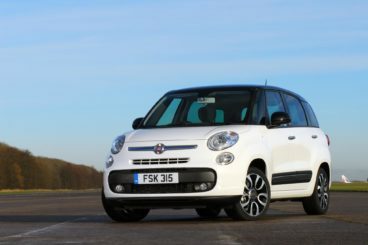 OSV takes a closer look at what it’s all about with our 2018 Fiat 500L Wagon Estate review. It really is a strange looking car, with some motor journalists going as far as saying that it looks like a blob of jelly! That’s a tad harsh but the good news is that it doesn’t wobble like a blob of jelly does. In fact, while it’s never the most entertaining car in the world (or in this class), the 500L Wagon Estate is at least easy to drive. Its handling is safe, secure and predictable. New anti-roll bars have been added to help the car cope with poorer roads, and body lean isn’t too much of an issue in bends. The tyres offer lots of grip but the steering does lack feel. There’s also a fair degree of weight added to the steering over the smaller 500 model, but the car doesn’t feel too heavy to drive. If you do find yourself wanting a bit more dynamism, specifying the bigger 17” alloys will help, if not by much. In terms of its engines, there’s no power plant on offer that produces over 105bhp. However, that doesn’t mean they can’t cope with the car on a full load. All engines come with manual gearboxes for that extra punch, too. The petrol range kicks off with a turbocharged 2.0-litre two-pot number that’s also seen in the popular city car. Here, it develops a healthier 105bhp and 145Nm of torque at 2,000rpm. That’s enough to get you from a standstill to 62mph in 13.0 seconds. Hardly earth-shattering stuff but the engine suits the car’s comfortable and easygoing nature. That said, the 6-speed manual gearbox requires a lot of effort and work from you, which goes against the car’s easygoing nature, but it’s at least fairly smooth. The 500L Wagon Estate represents a step-up in quality for Fiat. Okay, it’s not a BMW but the presence of a few high-quality plastics that also look durable is a pleasing sight. The controls are well assembled and easy to use, and they’re also logically arranged. The biggest issue for some buyers is that, despite being a member of the 500 family, this one doesn’t look or feel like a 500 inside. It looks a tad too conventional. That will please some buyers but not all. Its layout is similar to the Panda, a car with which it also shares its fittings. The screen is too low down for our liking, while the switchgear can be a tad frustrating to use. On the whole, smart cabin but one that isn’t free from criticism. Is the Fiat 500L Wagon Estate practical? It’s a five-seater in standard form, and anyone sat in the second row of seats is treated to plenty of space. This second row of seats slides back and forth, and when you slide it back, the space available is immense. Shoulder room is good, too. Converting the car into a seven-seater costs a bit extra, but the sixth and seventh seats are best suited to children, teenagers or average sized adults. Taller adults will certainly struggle back there. If you do specify the extra seats, you’ll also get treated to Fiat’s flexible frequency suspension that softens ride quality. Other than that, the boot measures 168-litres when all the seats are up and 400-litres when five seats are up. Standard kit is generous on all models. The entry-level model gets a 5” colour touchscreen uConnect infotainment system, electric front windows, air conditioning, buttons on the steering wheel, cruise control and Bluetooth. The Lounge model rounds things off with an automatically dimming rear-view mirror, an electric glass sunroof, dual zone climate control, dusk sensing headlights, rain detecting wipers, rear privacy glass and all-round electric windows. In terms of how safe the car is, Euro NCAP hasn’t yet put the car through its crash test paces. However, the smaller 500L model scored 5/5, and we’d expect this one to follow suit. In terms of its running costs, there’s just the one petrol engine available and it’s aimed at low mileage drivers who’ll be using the car for shorter trips. This is a 1.4-litre T-Jet petrol engine that develops 105bhp, and which can return 43mpg at best. It has a BiK rating of 30%. Maintenance for the first 3 years, meanwhile, can be covered by the brand’s Easy Care package if you choose to select it. Five people will be especially comfortable, but taller adults will struggle in the sixth and seventh seats. Other than that, there’s plenty of room for all. It’s distinctive and definitely different to any other MPV on the road at the moment. Fiat let you customise your car in a number of ways – a crucial part of its appeal to some buyers. A BiK rating of 30% can be considered quite high in this class, as can returns of 43mpg economy at best. Its rivals come with seven seats as standard. 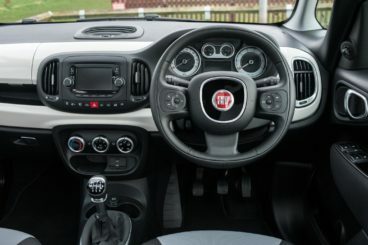 Let’s see how the car fares against its rivals in the comparison section of our 2018 Fiat 500L Wagon Estate review. 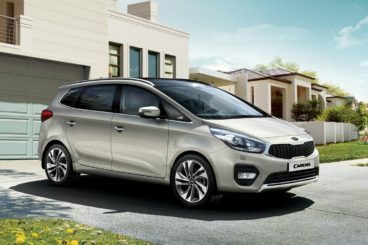 The new Kia Carens is a smart, safe and practical family car that comes with seven seats and a seven-year warranty. There are cars in this sector that are better to drive than the Carens but it’s super comfortable and quiet. Direct steering is contrasted with a lack of feel and it offers three settings: In the towns and cities you can lighten it up, while in the countryside you can make it heavier. In terms of its engines, a 1.6-litre GDI unit is the sole petrol offering. It’s not as powerful as the diesel options but it does have a useful 0-62 time of 10.9 seconds. It also comes with the brand’s ISG stop-start system. Running costs? Despite the ISG stop-start system, the sole petrol engine still struggles to return more than 45mpg, which makes it the least economical engine in the range by some distance. Emissions are pegged at 143g/km of CO2. For the sake of comparison, the range-topping diesel engine is able to return as much as 62.3mpg on a good day and emits 126g/km of CO2 at the most. The petrol variant is fairly cheap to insure, however, and occupies group 13 out of 50. Inside, Kia have really thought about the Carens’ interior and it’s one of the best in this class. The design is easy on the eye, the materials used are of a good quality and feel nice and durable, and everything on the dashboard is logically arranged. It’s definitely an upgrade on Kia’s of old. Is the Kia Carens practical? There are useful power sockets dotted around the place, not to mention plenty of cubbies. It’s also a really spacious car that offers more interior space than last time, despite being narrower and shorter. In fact, one benefit of being narrower and shorter is that it’s a bit easier to park. There are seven seats available as standard, although both head and legroom is a bit limited on the third row. There are no such concerns with the second row of seats, which slide back and forth with ease, and they also recline. The boot, meanwhile, measures 400-litres when all the seats are in place. Fold the third row of seats and it measures 492-litres. A false floor is a handy bonus. 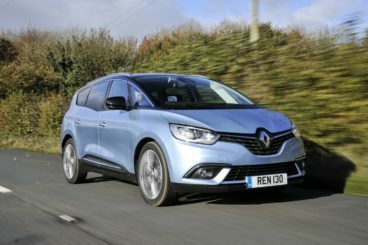 The new Renault Grand Scenic is practical, roomy and doesn’t cost too much to run if you pick the right engine. It’s also strikingly designed. On the road, it’s one of the best cars to drive in this class. Competent and well-mannered, it does lean in bends but you’ll be impressed by the amount of surefooted-ness it displays. One issue is the large 20” alloys. Ordinarily, they wouldn’t be a problem but Renault doesn’t offer an alternative. While they look fab, they don’t deal with lumps and bumps at all well. In terms of the engines, just the one petrol is available. This is a brand new 1.3-litre unit that comes with turbochargers and two separate power outputs. Both variants deliver their power with more urgency than the 1.2-litre petrol unit they’ve replaced. The smaller of the two develops 113bhp and completes the 0-62 sprint in 11.8 seconds, while the bigger of the two develops 138bhp and completes the 0-62 sprint in 10.3 seconds. Running costs? The two petrol variants might have significantly different power outputs but they can both return similar economy figures. The 113bhp variant is good for returns of 50.4mpg, while the bigger 138bhp variant can return 51.4mpg on a good day. Inside, Renault have installed a classy new dashboard that comes with a large 8.8” touchscreen on higher spec models. Entry level models make do with a seven-inch screen but the dash is still a swanky affair. Comfort levels are good and the cabin as a whole is modern, clean and easy to live with. However, it won’t be until November that Renault will introduce Android Auto and Apple CarPlay. Is the Renault Grand Scenic practical? Space up front is very good, but the middle row of seats in this seven-seater are more cramped than rivals. This second row is comprised of three individual seats, and even when slid all the way back, adults will feel that legroom is tight. Adults can squeeze into the third row but it’s aimed at kids. Access to both the second and third rows, meanwhile, is tricky. Other than that, storage solutions are good and there are lots of bins and cubbies here and there. The third row of seats fold neatly into the boot which, incidentally, measures 596-litres when you do that. A low loading lip is a bonus. Not everyone is going to like the way it looks, but if you happen to like it’s rather unique looks, you’re onto a winner. The new Fiat 500L Wagon Estate is practical, spacious, modern and great for all the family.